Green industry icon Ernest Wertheim shares stories from his memoir, Chasing Spring, and wisdom gained from his vast career in landscape architecture. Ernest Wertheim has worn lots of shoes, to borrow a line from a famous movie. Born in Germany to a Jewish family during Adolf Hitler’s rise to power, a teenaged Ernest helped others escape from Germany before fleeing himself. His parents perished in the Holocaust, along with more than six million other Jews, and millions of other people, who were murdered by the Nazi regime. After emigrating to America, he was drafted as an “enemy alien” into the U.S. Army and stationed in the Pacific Ocean theater, where he served under General Douglas MacArthur. After the war, he settled in San Francisco, California, and was finally able to pursue a career in the field that fascinated him since early childhood: horticulture. 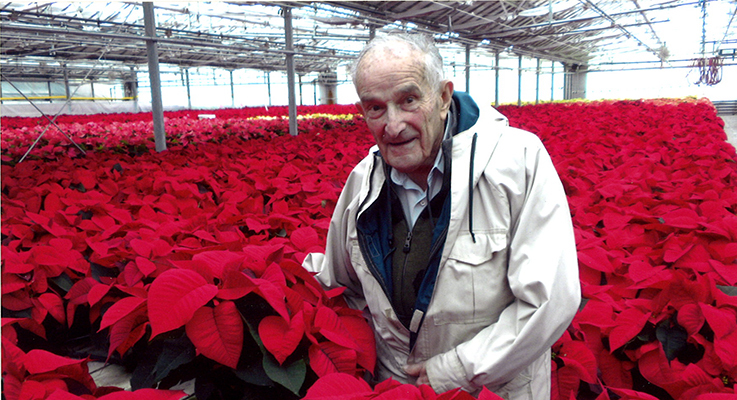 He founded the firm Wertheim, Van der Ploeg in 1953, and in 1954 he designed from the ground up what is considered the first retail garden center, Orchard Nursery in Lafayette, California. Over the next 60-plus years, he has designed green spaces of all shapes and sizes around the world, including a couple projects in Oregon — Al’s Garden Center in Sherwood, and Shonnard’s Nursery, Florist and Landscape in Corvallis. According to Bigej, one thing Ernest’s garden center designs really excel at is maximizing traffic flow — how a customer gets from point A to point B during their retail garden center experience. Lynnette Shonnard remembers the day in 1998 when she showed Ernest the plans created for her new facility by another designer, who was not garden center oriented. Flow was the thing sorely lacking from these initial designs. Today, at 96 years of age, Ernest still walks the walk and talks the talk, consulting on projects and giving lectures about his life and work. “He relates so well to every generation, which is pretty amazing when you’re 90-plus years old. I’ve never met anyone like him,” Shonnard said. Here’s a preview of some of the topics Ernest will discuss during his seminars at the upcoming 2016 Farwest Show, set for August 25–27 in Portland, Oregon. Your interest in plants began when you were very young, and was greatly influenced by your grandfather, who was a hobbyist plantsman, and your mother. What would they think of your life’s work? My grandfather died prior to Hitler and was not influenced by the fact that one needed some expertise if one wanted to succeed in another country. I know that he was very proud and encouraging when I became a member of the local Cactus Society. I was 9 years old. At that time my dream was to become a botanist who would travel to other countries to collect plants. I knew at that time this required several years at the university. Two times he invited me to go with him to the Berlin chapter of the Cactus Society and he was very proud to introduce me to his colleagues. At that time I did have a good knowledge of many species. At times we also visited with other plant people. My mother loved flowers, in particular lilacs and tulips, and in addition acacias, which were shipped in as cut flowers from Italy in early spring. I would buy them for mother. I also bought for her lady slipper orchids (Cypripedium). That’s how I learned to make floral arrangements. You entered college at the remarkably young age of 14. What were some of the challenges you faced? The years were equivalent to four years in the United States, because the studies were year-round except for a Christmas vacation .… The fact that I was so young and did have to prove myself to the professors was a great personal incentive. How is the relationship between people and their environment different today than 20, 50, 70 years ago? When I came to California in January 1939, few people knew the term “landscape architect” and few people used a landscape architect for their gardens, although (Frederick Law) Olmsted did Stanford University. When we started the first garden center in 1954, we were dealing with a retail nursery which was very plant oriented. Products were added and it became a garden center. Today I do not think that the word has the same meaning as it did in the mid-’50s. The question now is: Do we wish to retain the term “garden center”? If not, what is today’s meaning? This is a very important question and most likely will not be answered in the near future. Here in Oregon, you have designed retail garden centers for Al’s Garden Center and Shonnard’s. What has been your impression of Oregon and the plant material coming out of the state? Oregon has a lot of good plant people and they in general offer very good quality. I have attended at least four garden center tours in your state. It took your people some time to catch on to what a good garden center should be like. People in Oregon have been self sufficient for many years and they were not used to engaging qualified consultants for the design of a retail facility or for that matter even a growing operation. What advice would you give to the next generation of landscape architects and horticulturists? We do need to let young people in high school know what this profession is all about and what the opportunities are. To be successful may take a lot longer than in the electronic industry but the rewards may be more satisfying. My advice to the next generation of landscape architects is: Be certain of what part of the profession you wish to follow. This means you will need a good introduction about how complex this profession really is. There was a will to succeed and also the will to help others and do a good job. From 1–2:30 p.m. on Thursday, August 25, Ernest will talk about his memoir Chasing Spring, which covers his early life in Germany under Hitler; his escape from Germany to California in 1939; his service under General MacArthur; and his start after World War II in San Francisco as a landscape architect. The lecture will also cover his work as a garden center designer, which has earned him a place in the American Society of Landscape Architects’ Hall of Fame. From 3–4 p.m. on Friday, August 26, he will address the topic, “Establishing a Design/Build Department in a Garden Center.” According to Ernest, garden center sales can be increased if there is a year-round design department. It is also helpful to have a construction division that can then install the design and possibly also a maintenance department that keeps a continuous relationship with the customer. The lecture will cover the pros and cons of such a venture. Don’t miss these two opportunities to learn firsthand from a master of life and work.